Provide a managed parcel editing environment for simplistic integration with other TBEST functional elements and analysis engines including TBEST Scenarios, ridership estimation, market analysis, and network accessible market analysis. Parcel Scenario development is supported by the TBEST Parcel Editor. 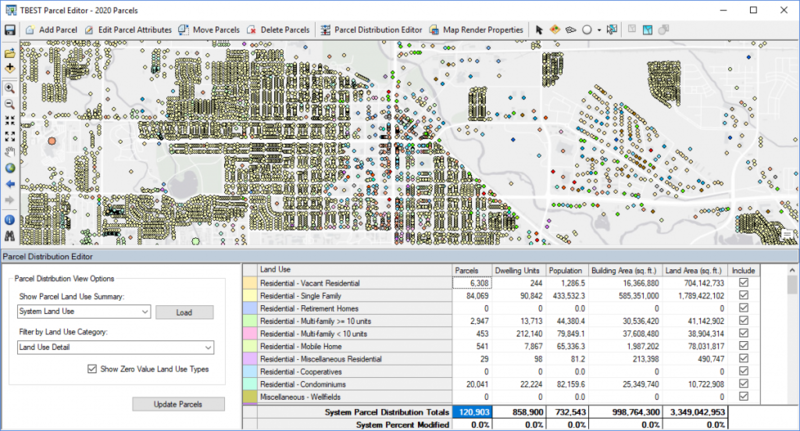 The Parcel Editor is a GIS-based interface for editing parcel locations, attributes, and densities allowing users to create a variety of land use distributions and test the implications on transit utilization. Finally, the TBEST framework supports association of Parcel Scenarios with Network Scenarios to provide users with full analytical power to modify land use in conjunction with transit service distribution.